Any Way to See Cookies' Values? I found an add-on to do this in Firefox but it won't work in SeaMonkey and I was wondering if anyone knew how to see the values of the cookies? This should be a part of the Cookie Manager screen. wpr wrote: I found an add-on to do this in Firefox but it won't work in SeaMonkey and I was wondering if anyone knew how to see the values of the cookies? This should be a part of the Cookie Manager screen. There was good extension to manage cookies - Cookie Monster but it was removed by developer (Tony Schilling) when Mozilla released new Fx57 with new "WebExtensions". Your post turned me on to the Content part in the Information section. Though I had seen this before, having used the Data Manager many times, I didn't realize that the Content line is the cookie's value. It would be so much easier if that variable were included in the top section, along with Website, Cookie Name, etc. I was hoping your Cookie Monster extension would do this, but no such luck. wpr wrote: I was hoping your Cookie Monster extension would do this, but no such luck. 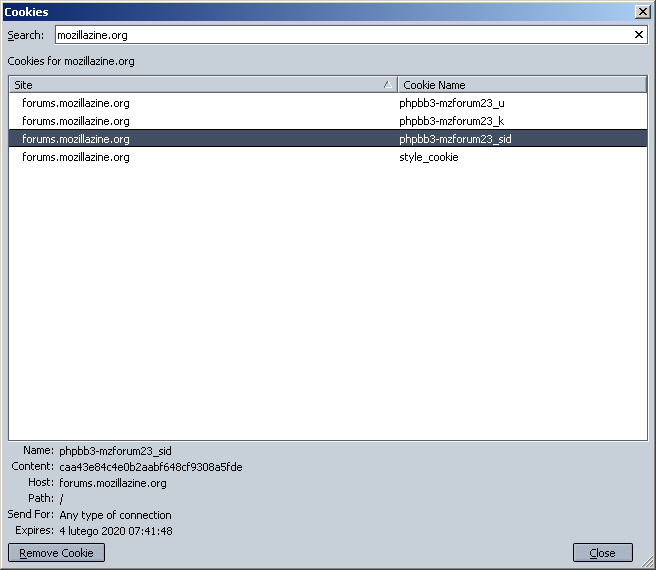 BTW Tip from user Anonymosity was about some small change to allow view cookies under SeaMonkey. If you want to use it then you must change value for SeaMonkey version in "install.rdf" file. Easiest way is to use 7-Zip. The problem these days is that the content of cookies is not in plain text any more. What is not just an ID number is encrypted, so not human-readable. TPR75 wrote: There was good extension to manage cookies - Cookie Monster but it was removed by developer (Tony Schilling) when Mozilla released new Fx57 with new "WebExtensions". Cookie Monster largely replicates functionality that is still present in Seamonkey, though hidden. chrome://communicator/content/permissions/cookieViewer.xul brings up the "old" cookie viewer that the data manager is supposed to replace. LordOfTheBored wrote: Cookie Monster largely replicates functionality that is still present in Seamonkey, though hidden. The old cookie viewer will still work in 2.57. I am using it daily in 2.53 to blow away all cookies fast when i feel this is needed. Can't say if Cookie Monster works but it should be fixable even in 2.57 if not.